The right to stay alive! The poor are turned away. The ones who cannot pay. Can we just turn our backs? Is not freedom at all! It was knocking down his home. That the seamstress sweated for. 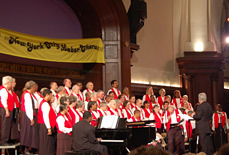 Our 2007 Gala Benefit Concert was a sold out success! Below is the Concert Program which describes the exciting music we performed on June 16, 2007. Words by Billy Bragg, melody from the anti-slavery song of the American Civil War, "The Battle Cry of Freedom." Words and music by Peter Schlosser. Words and music by Florence Reece, wife of a union leader in the 1931 miners strike of Harlan County, Kentucky. Written after the sheriff, J.H. Blair, and his goons broke into her home while she was protecting her young children. Out of the struggles in South Africa. An anti-apartheid song from South Africa. Contains coded information for runaway slaves: "The Drinking Gourd" is the Big Dipper, which points North; "Peg Foot" refers to Peg Leg Joe, who helped spread information from plantation to plantation; and "when the sun comes back and the first quail calls" refers to wintertime, when the Ohio River is frozen so escapees could walk across. Arrangement by Peter Schlosser. Old German political song dating back to the era of The Peasant's War [1524-1526], a forerunner of the great freedom revolts which culminated in the French Revolution. Arrangement by Peter Schlosser. Chorus sung by the Hebrew slaves in Verdi's "Nabucco", it became the unofficial hymn of Italian national liberation and reunification. Words by Bertolt Brecht, music by Kurt Weill, English words by M. Blitzstein, from "Threepenny Opera." Arrangement by Peter Schlosser. An Irish song, generally dated to the early 19th century, when Irish troops served the British East India Company. Arrangement by Peter Schlosser. From the Spanish Civil War. Chorus from the constitution of the American Miners Union circa 1860 with additional words by our own bass, Jeff Vogel. Sung to a traditional Irish melody. Written by Lee Hayes and the Almanac Singers. Arrangement by Peter Schlosser. Words by Woody Guthrie to the tune of "Red Wing" arranged by Peter Schlosser. British Transport Workers' Union Song. Arranged by Geoffrey Fairweather, reconstructed by Barbara Barnes, Gene Glickman and Dennis Nelson.